Kárbọ̀nù (láti Látìnì: carbo "èédú") je ipilese kemika to ni ami-idamo C ati nomba atomu 6. Gẹ́gẹ́ bí ìkan nínú ẹgbẹ́ 14 lórí tábìlì ìdásìkò àwọn ẹ́límẹ̀ntì, ó jẹ́ aláìjẹ́-mẹ́tàlì àti afagbáramẹ́rindìmú—èyí jẹ́ pé ẹ̀lẹ́ktrọ́nù mẹ́rin wà láti dá ìsopọ̀ kẹ́míkà àjọfagbáradìmú. Àwọn ísótòpù kárbọ̀nù mẹ́ta ni wọ́n wà fún ra wọn, 12C àti 13C jẹ́ dídúró, nígbàtí 14C jẹ́ onítítànyindin, tóúntúká díẹ̀díẹ̀ pẹ̀lú àsìkò àbọ̀-ìgbéayé tó tó bíi ọdún 5,730. Kárbọ̀nù ni ìkan nínú àwọn ẹ́límẹ̀ntì díẹ̀ tí wọ́n ti jẹ́ dídámọ̀ láti ìgbà àtijọ́. Orísi àwọn álótrópù kárbọ̀nù lọ́wà tí èyí tó gbajúmọ̀ nínú wọn jẹ́ gráfáìt, díámọ́ndì, àti kárbọ̀nù àìlétòara. Àwọn ìní oníṣeẹ̀dá kárbọ̀nù yàtọ̀ gẹ́gẹ́bí irú álótrópù bá ṣe rí. Fún àpẹrẹ, díámọ́ndì jẹ́ híhannú, nígbàtí gráfáìt jẹ́ dídinú tó sì dúdú. Díámọ́ndì jẹ́ ìkan nínú àwọn èròjà tó le jùlọ, nígbàtí gráfáìt jẹ́ dídẹra dáadáa tó bẹ̀ẹ̀ láti fi kọ ìwé. Díámọ́ndì ní ìgbéwọra oníṣetanná tó kéré gidi, nígbàtí gráfáìt jẹ́ olùgbéwọra tó dára gidigidi. Lábẹ́ àwọn ìṣẹ̀lẹ̀ onídéédé, díámọ́ndì, nánótúbù kárbọ̀nù àti grafínnì ní ìgbéwọra onígbígbóná tó gajùlọ ní àrin àwọn èròjà tí a mọ̀. Gbogbo àwọn álótrópù kárbọ̀nù jẹ́ aláralíle ní abẹ́ ìṣẹ̀lẹ̀ onídéédé tí gráfáìt jẹ́ irú èyí tó jẹ́ dídúró jùlọ níagbára onítigbígbóná. Wọ́n jẹ́ olódì sí kẹ́míkà bẹ́èsìni wọ́n fẹ́ ìgbónásí gíga láti túndaramọ́ra gan mọ́ ọ́ksíjìn. The most common Ipòàyè ìsọdiọ̀ksídì kárbọ̀nù nínú àwọn àdàpọ̀ aláìníọ́rgánì ni +4, nígbàtí +2 wà nínú mónọ́ksídì kárbọ̀nù àti àwọn metali irekoja karbonili miran. Orisun totobijulo karbonu alainiorgani ni okuta-efun, dolomaiti ati dioksidi karbonu, sugbon opo re tun wa ninu awon ìwalẹ̀ oniorgani èédú, peat, epo petroliomu ati klatarati methani. Karbonu se Carbon forms more adapo ju awon elimenti yiowu lo, bi milionu mewa adapo oniorgani ogidi lo wa titi doni, sibe awon yi ko ju ida die lo ninu gbogbo iye iru adapo karbonu to se e se labe isele onideede. Karbonu ni elimenti 15k to gbalejulo ni inu iwule Aye, ati elimenti kerin to gbale julo ninu agbala-aye gegebi iye akojo leyin háídrójìn, hílíọ̀mù, ati ọ́ksíjìn. O wa ninu gbogbo iru eda ohun alaye, be sini ninu ara eniyan karbonu ni elimenti keji to gbalejulo gegebi iye akojo (bi 18.5%) leyin oksijin. Igbale yi, lapapo mo ipinsorisirisi awon adapo organiki ati agbara won lati da polimeri ni ibi igbonasi to wopo ni ile Aye, so elimenti yi di ipile kemika gbogbo ohun elemi. Àwọn orísi ìdá tàbí álótrópù kárbọ̀nù (ẹ wo ìsàlẹ̀) ní nínú wọn ohun tó le jùlọ ní ìdáyé, díámọ̀ndì, àti èyi tó jẹ́ ìkan nínú ohun rírọ̀ jùlọ, gráfáìtì. Bákannáà, ó ní ìfẹ́ fún ìsopọ̀ mọ́ àwọn átọ̀mù kékeré míràn, bíi àwọn átọ̀mù kárbọ̀nù míràn, ó sí le dá ọ̀pọ̀ ìsopọ̀ àjọfagbáradìmú afẹsẹ̀múlẹ̀ mọ́ àwọn átọ̀mú báyìí. Nítorí ẹ̀yí, kárbọ̀nù le dá orísirísi àdàpọ̀ tó pọ̀ tó mílíọ́mù mẹ́ẹ̀wá; ogunlọ́gọ̀ gbogbo àwọn àdápọ̀ kẹ́míkà. Carbon also has the highest sublimation point of all elements. 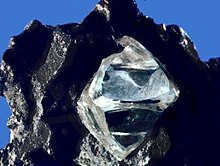 At atmospheric pressure it has no melting point as its triple point is at 10.8 ± 0.2 MPa and 4,600 ± 300 K (~4,330 °C or 7,820 °F), so it sublimates at about 3,900 K.
Synthetic nanocrystalline diamond is the hardest material known. Graphite is one of the softest materials known. Diamond is the ultimate abrasive. Graphite is a very good lubricant, displaying superlubricity. Diamond is an excellent electrical insulator. Graphite is a conductor of electricity. Diamond is highly transparent. Graphite is opaque. Diamond crystallizes in the cubic system. Graphite crystallizes in the hexagonal system. In combination with oxygen in carbon dioxide, carbon is found in the Earth's atmosphere (approximately 810 gigatonnes of carbon) and dissolved in all water bodies (approximately 36,000 gigatonnes of carbon). Around 1,900 gigatonnes of carbon are present in the biosphere. Hydrocarbons (such as coal, petroleum, and natural gas) contain carbon as well—coal "reserves" (not "resources") amount to around 900 gigatonnes, and oil reserves around 150 gigatonnes. Proven sources of natural gas are about 175 1012 cubic metres (representing about 105 gigatonnes carbon), but it is estimated that there are also about 900 1012 cubic metres of "unconventional" gas such as shale gas, representing about 540 gigatonnes of carbon. (In the past, quantities of hydrocarbons were greater. In the period from 1751 to 2008 about 347 gigatonnes of carbon were released as carbon dioxide to the atmosphere from burning of fossil fuels.) Carbon is also locked up as methane and methane hydrates in polar regions. It is estimated that at least 1,400 Gt of carbon is in this form just in (and under) the submarine permafrost of the Siberian Shelf. Carbon-14 (14C) is a naturally occurring radioisotope which occurs in trace amounts on Earth of up to 1 part per trillion (0.0000000001%), mostly confined to the atmosphere and superficial deposits, particularly of peat and other organic materials. This isotope decays by 0.158 MeV β− emission. Because of its relatively short half-life of 5730 years, 14C is virtually absent in ancient rocks, but is created in the upper atmosphere (lower stratosphere and upper troposphere) by interaction of nitrogen with cosmic rays. The abundance of 14C in the atmosphere and in living organisms is almost constant, but decreases predictably in their bodies after death. This principle is used in radiocarbon dating, invented in 1949, which has been used extensively to determine the age of carbonaceous materials with ages up to about 40,000 years. ↑ "History of Carbon and Carbon Materials - Center for Applied Energy Research - University of Kentucky". Caer.uky.edu. Retrieved 2008-09-12. ↑ 4.0 4.1 Haaland, D (1976). 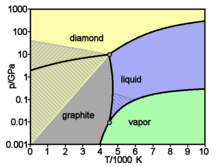 "Graphite-liquid-vapor triple point pressure and the density of liquid carbon". Carbon 14 (6): 357. doi:10.1016/0008-6223(76)90010-5. ↑ 5.0 5.1 Savvatimskiy, A (2005). "Measurements of the melting point of graphite and the properties of liquid carbon (a review for 1963–2003)". Carbon 43 (6): 1115. doi:10.1016/j.carbon.2004.12.027. ↑ "Fourier Transform Spectroscopy of the System of CP" (PDF). Retrieved 2007-12-06. ↑ "Fourier Transform Spectroscopy of the Electronic Transition of the Jet-Cooled CCI Free Radical" (PDF). Retrieved 2007-12-06. ↑ "Carbon: Binary compounds". Retrieved 2007-12-06. ↑ 11.0 11.1 11.2 "Carbon – Naturally occurring isotopes". WebElements Periodic Table. Retrieved 2008-10-09. ↑ "Periodic Table: Date of Discovery". Chemical Elements.com. Retrieved 2007-03-13. ↑ 14.0 14.1 "World of Carbon – Interactive Nano-visulisation in Science &Engineering Edukation (IN-VSEE)". Retrieved 2008-10-09. ↑ 15.0 15.1 Chemistry Operations (December 15, 2003). "Carbon". Los Alamos National Laboratory. Archived from the original on 2008-09-13. Retrieved 2008-10-09. ↑ Greenville Whittaker, A. (1978). "The controversial carbon solid−liquid−vapour triple point". Nature 276 (5689): 695–696. Bibcode 1978Natur.276..695W. doi:10.1038/276695a0. ↑ Zazula, J. M. (1997). "On Graphite Transformations at High Temperature and Pressure Induced by Absorption of the LHC Beam". CERN. http://lbruno.home.cern.ch/lbruno/documents/Bibliography/LHC_Note_78.pdf. Retrieved 2009-06-06. ↑ Sanderson, Bill (2008-08-25). "Toughest Stuff Known to Man : Discovery Opens Door to Space Elevator". nypost.com. Retrieved 2008-10-09. ↑ Irifune, Tetsuo; Kurio, Ayako; Sakamoto, Shizue; Inoue, Toru; Sumiya, Hitoshi (2003). "Materials: Ultrahard polycrystalline diamond from graphite". Nature 421 (6923): 599–600. doi:10.1038/421599b. PMID 12571587. ↑ Dienwiebel, Martin; Verhoeven, Gertjan; Pradeep, Namboodiri; Frenken, Joost; Heimberg, Jennifer; Zandbergen, Henny (2004). "Superlubricity of Graphite". Physical Review Letters 92 (12). doi:10.1103/PhysRevLett.92.126101. http://www.physics.leidenuniv.nl/sections/cm/ip/group/PDF/Phys.rev.lett/2004/92(2004)12601.pdf. ↑ Collins, A.T. (1993). "The Optical and Electronic Properties of Semiconducting Diamond". Philosophical Transactions of the Royal Society A 342 (1664): 233–244. Bibcode 1993RSPTA.342..233C. doi:10.1098/rsta.1993.0017. ↑ Deprez, N.; McLachan, D. S. (1988). "The analysis of the electrical conductivity of graphite conductivity of graphite powders during compaction". Journal of Physics D: Applied Physics (Institute of Physics) 21 (1): 101. Bibcode 1988JPhD...21..101D. doi:10.1088/0022-3727/21/1/015. ↑ Delhaes, P. (2001). Graphite and Precursors. CRC Press. ISBN 90-5699-228-7. http://books.google.com/?id=7p2pgNOWPbEC&pg=PA146. ↑ 27.0 27.1 Ebbesen, T. W., ed (1997). Carbon nanotubes—preparation and properties. Boca Raton, Florida: CRC Press. ISBN 0-8493-9602-6. ↑ 28.0 28.1 Dresselhaus, M. S.; Dresselhaus, G.; Avouris, Ph., ed (2001). "Carbon nanotubes: synthesis, structures, properties and applications". Topics in Applied Physics (Berlin: Springer) 80. ISBN 3-540-41086-4. ↑ 29.0 29.1 Nasibulin, Albert G.; Pikhitsa, P. V.; Jiang, H.; Brown, D. P.; Krasheninnikov, A. V.; Anisimov, A. S.; Queipo, P.; Moisala, A. et al. (2007). "A novel hybrid carbon material". Nature Nanotechnology 2 (3): 156–161. Bibcode 2007NatNa...2..156N. doi:10.1038/nnano.2007.37. PMID 18654245. ↑ Nasibulin, A; Anisimov, Anton S.; Pikhitsa, Peter V.; Jiang, Hua; Brown, David P.; Choi, Mansoo; Kauppinen, Esko I. (2007). "Investigations of NanoBud formation". Chemical Physics Letters 446: 109–114. Bibcode 2007CPL...446..109N. doi:10.1016/j.cplett.2007.08.050. ↑ Vieira, R; Ledoux, Marc-Jacques; Pham-Huu, Cuong (2004). "Synthesis and characterisation of carbon nanofibers with macroscopic shaping formed by catalytic decomposition of C2H6/H2 over nickel catalyst". Applied Catalysis A 274: 1–8. doi:10.1016/j.apcata.2004.04.008. ↑ 32.0 32.1 Clifford, Frondel; Marvin, Ursula B. (1967). "Lonsdaleite, a new hexagonal polymorph of diamond". Nature 214 (5088): 587–589. Bibcode 1967Natur.214..587F. doi:10.1038/214587a0. ↑ Rode, A. V.; Hyde, S. T.; Gamaly, E. G.; Elliman, R. G.; McKenzie, D. R.; Bulcock, S. (1999). "Structural analysis of a carbon foam formed by high pulse-rate laser ablation". Applied Physics A-Materials Science & Processing 69 (7): S755–S758. doi:10.1007/s003390051522. ↑ 35.0 35.1 35.2 Heimann, Robert Bertram; Evsyukov, Sergey E. and Kavan, Ladislav (28 February 1999). Carbyne and carbynoid structures. Springer. pp. 1–. ISBN 978-0-7923-5323-2. http://books.google.com/books?id=swSQZcTmo_4C&pg=PA1. Retrieved 6 July 2011. ↑ Jenkins, Edgar (1973). The polymorphism of elements and compounds. Taylor & Francis. p. 30. ISBN 0-423-87500-0. http://books.google.com/books?id=XNYOAAAAQAAJ&pg=PA30. Retrieved 2011-05-01. ↑ Schewe, Phil and Stein, Ben (March 26, 2004). "Carbon Nanofoam is the World's First Pure Carbon Magnet". Physics News Update 678 (1). http://www.aip.org/pnu/2004/split/678-1.html. ↑ Itzhaki, Lior; Altus, Eli; Basch, Harold; Hoz, Shmaryahu (2005). "Harder than Diamond: Determining the Cross-Sectional Area and Young's Modulus of Molecular Rods". Angew. Chem. Int. Ed. 44 (45): 7432–5. doi:10.1002/ange.200502448. PMID 16240306. ↑ Mark, Kathleen (1987). Meteorite Craters. University of Arizona Press. ISBN 0-8165-0902-6. ↑ "Wonderfuel: Welcome to the age of unconventional gas" by Helen Knight, New Scientist, 12 June 2010, pp. 44–7. ↑ Calculated from file global.1751_2008.csv in  from the Carbon Dioxide Information Analysis Center. ↑ Kasting, James (1998). "The Carbon Cycle, Climate, and the Long-Term Effects of Fossil Fuel Burning". Consequences: the Nature and Implication of Environmental Change 4 (1). http://gcrio.org/CONSEQUENCES/vol4no1/carbcycle.html. ↑ Stefanenko, R. (1983). Coal Mining Technology: Theory and Practice. 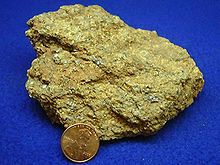 Society for Mining Metallurgy. ISBN 0-89520-404-5. ↑ Gannes, Leonard Z.; Del Rio, Carlos Martı́nez; Koch, Paul (1998). "Natural Abundance Variations in Stable Isotopes and their Potential Uses in Animal Physiological Ecology". Comparative Biochemistry and Physiology – Part A: Molecular & Integrative Physiology 119 (3): 725–737. doi:10.1016/S1095-6433(98)01016-2. ↑ "Official SI Unit definitions". Retrieved 2007-12-21. ↑ Brown, Tom (March 1, 2006). "Carbon Goes Full Circle in the Amazon". Lawrence Livermore National Laboratory. Retrieved 2007-11-25. ↑ Bowman, S. (1990). Interpreting the past: Radiocarbon dating. British Museum Press. ISBN 0-7141-2047-2. ↑ Libby, W. F. (1952). Radiocarbon dating. Chicago University Press and references therein. ↑ Westgren, A. (1960). "The Nobel Prize in Chemistry 1960". Nobel Foundation. Retrieved 2007-11-25. ↑ "Use query for carbon-8". barwinski.net. Retrieved 2007-12-21. ↑ Watson, A. (1999). "Beaming Into the Dark Corners of the Nuclear Kitchen". Science 286 (5437): 28–31. doi:10.1126/science.286.5437.28. http://www.sciencemag.org/cgi/content/full/286/5437/28?ck=nck. ↑ Audi, G; Bersillon, O.; Blachot, J.; Wapstra, A.H. (1997). "The Nubase evaluation of nuclear and decay properties". Nuclear Physics A 624: 1. Bibcode 1997NuPhA.624....1A. doi:10.1016/S0375-9474(97)00482-X. http://amdc.in2p3.fr/nubase/nubase97.pdf. ↑ Ostlie, D.A. and Carroll, B.W. (2007). An Introduction to Modern Stellar Astrophysics. Addison Wesley, San Francisco. ISBN 0-8053-0348-0. ↑ Whittet, D. C. B. (2003). Dust in the Galactic Environment. CRC Press. pp. 45–46. ISBN 0-7503-0624-6. ↑ Pikelʹner, Solomon Borisovich (1977). Star formation. Springer. pp. 38–. ISBN 978-90-277-0796-3. http://books.google.com/books?id=qbGLgcxnfpIC&pg=PA38. Retrieved 6 July 2011. ↑ Falkowski, P.; Scholes, RJ; Boyle, E; Canadell, J; Canfield, D; Elser, J; Gruber, N; Hibbard, K et al. (2000). "The Global Carbon Cycle: A Test of Our Knowledge of Earth as a System". Science 290 (5490): 291–296. Bibcode 2000Sci...290..291F. doi:10.1126/science.290.5490.291. PMID 11030643. ↑ Smith, T. M.; Cramer, W. P.; Dixon, R. K.; Leemans, R.; Neilson, R. P.; Solomon, A. M. (1993). "The global terrestrial carbon cycle". Water, Air, & Soil Pollution 70: 19–37. doi:10.1007/BF01104986.